okay, so I let go of our apartment and I told a waitress she could have it. I have my daughter in a foreign country with no passport to come home. I pissed off a real estate agent to the point where he wrote me a text saying that he had lost faith in humanity because of my actions. I arranged to sign for a new apartment based on the word of a girl who I've met three times, maybe four. Today she held my hand, gave me a homemade, gluten-free muffin, and listened to me tell her that I was afraid to be alone. I just had a neediness flashback from my 20s. Anyway, we are packing everything up. Please, people, tell me I'm going somewhere. 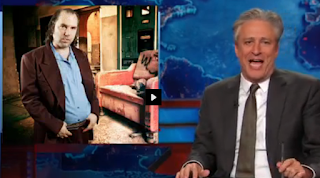 Here is Jon Stewart's story on corruption and dig on real estate brokers. Let's just say his name is oh I don't know . . Pablo. Close enough.